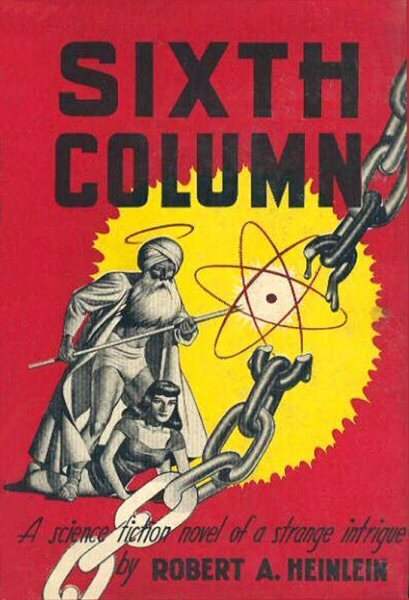 Here’s the follow-up Heinlein review as promised, to a novel originally entitled SIXTH COLUMN (magazine publication as a serial in Astounding: January to March 1941 as by Anson MacDonald) and also THE DAY AFTER TOMORROW (in hardback by Gnome Press in 1949 and in paperback by Signet in 1951). Well, he got that right. There is no way around it. This book is awful. It’s not only a swing and a miss, it should have sent Heinlein’s career to the disabled list, and, in a sense it did. 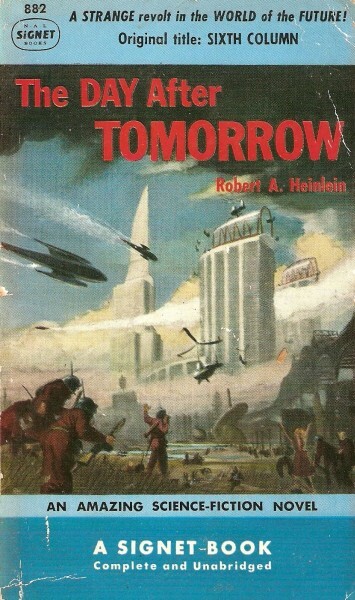 It took eight years for it to appear in book form and ten years for a major publisher to pick it up, despite the fact that Heinlein was arguably by then the most popular sf writer in the world. The most disturbing thing about it is the racism. If Heinlein rewrote it to “remove racist aspects,” I’d hate to have seen the original screed. Second is the shoddy plotting. Third — but why go on? Read the review. Campbell’s reputation dodged a bullet with this one, since not one in a thousand Heinlein readers knows that Campbell actually came up with this turkey. But it’s Heinlein’s name on it and even though I’m sympathetic to the fact that a man’s gotta eat, he’s also gotta take the heat when he produces work less distinguished than he’s capable of. Overall, this book rates a 19, which is tied for (so far) the third worst sf/fan novel of the 1950s. Four down, about 700 more to go.